As a fairly new member of the Star Wars fan club and a long-time member of the Alex Bracken fan club, I knew that I wanted to pick this book up! The book recounts the classic story with some new narrators and insight into their inner worlds. 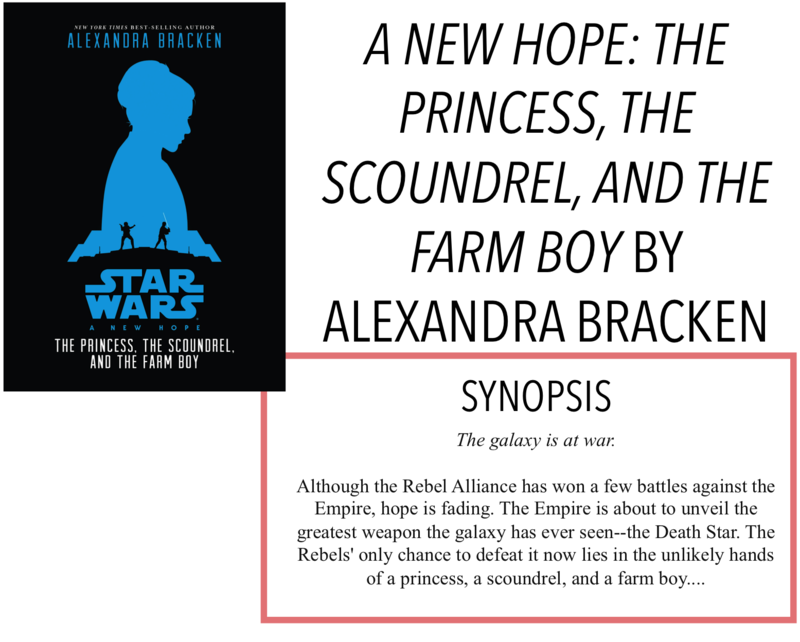 I am back with another review, today it is A New Hope: The Princess, the Scoundrel, and the Farm Boy by Alexandra Bracken. I'm not really going to give a synopsis of this book because it is basically Episode IV. I will say, however, that it is unique because the story is divided into three parts with three different narrators. The first part/narrator is Princess Leia. She narrates her capture and involvement in the Rebellion. The storyline and plot were basically the same as the original Episode but we see some of Leia's inner thoughts with this section. She describes what it's like to be underestimated and objectified by Darth Vader and the other senators who just see her as a pretty face and ignore her ideas. Leia is one of those iconically strong female characters and Bracken really reinforced that in this part of the novel. The next section is narrated by Han Solo. Like Leia's, this part focuses on the original story, but from Han's perspective, and basically picks up right after Leia's capture. Bracken does a great job of humanizing Han, I know, at least in the parts I've seen of the movies, he's not necessarily the most giving guy, especially when he is first introduced. Bracken, however, shows that he does care about Luke and Ben, even if he doesn't want to. The third part is narrated by Luke and follows up where Han's part ends. Once again, we see the inner workings of the character, beyond just the third-person depiction in the movies. Luke's part also includes the iconic destruction of the Death Star, and it was really interesting to see the battle from his point of view. Even though I've already seen the movie, I still think this book is a really interesting and well-done addition to any fan's collection. Not only does it skillfully retell the experiences of Episode IV, but it also provides an insight into the minds and feelings of the characters. That being said, I think if you are new to the franchise and don't have a lot of background knowledge or haven't seen the movies yet, you will still really enjoy this book. Bracken does a great job of explaining details that are important to the story but might not be common knowledge for newer fans. I'm by no means an expert, but I found some new info and thought that it helped me better understand what happened in the movie. I suppose this is technically middle grade, but I found it on par with younger YA as well. I don't think younger readers will have issues understanding what is happening and I don't think older readers will be bored. I found the depictions of the characters fairly spot on in terms of the movies, but then again, I'm no expert! I did find it to be a quick and easy read - so it would be perfect for readers of all ages. Overall, this is the perfect book for both veteran lovers of this story and newer fans who need a bit of help to grasp the story.